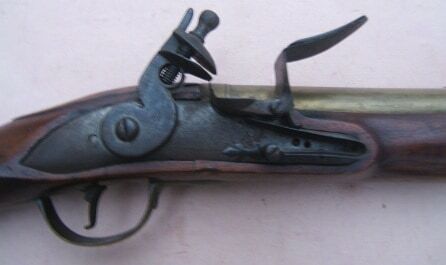 A FINE+ UNTOUCHED FRENCH & INDIAN/AMERICAN REVOLUTIONARY WAR PERIOD ENGLISH BRASS BARREL FLINTLOCK SEA SERVICE/NAVAL TYPE BRASS BARREL BLUNDERBUSS, ca. 1750: In overall fine+ untouched condition. Early London proofed–two (2) early, London Gunmaker Co. proof marks, 16″, pin-fastened, round-to-round, heavy-gauge, cannon-form, smoothbore, brass barrel with 1.35+ caliber pronounced/flared-cannon-form muzzle and a baluster-turned breech. 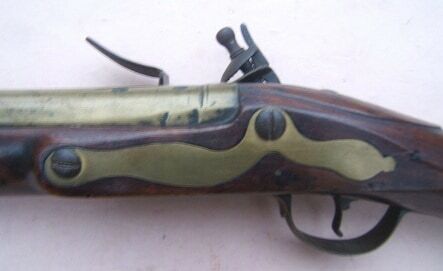 In original flintlock condition with its thread-engraved, early banana-form, Board of Ordnance Pattern, thread-engraved lockplate; and its matching reinforced “Sea Service” type hammer and a trefoil finial frizzen. The face of the lock with untouched, lightly sea-pitted, gunmetal-patinated, steel surfaces. Retains its original lock components with a strong mainspring, fine timing and both its original sidebolts. Molded and carved, “Regulation Pattern” Sea Service, walnut fullstock with simple raised carvings around the lock and sidebolt mortises; and a classic Triangular-form buttstock with a deeply fluted comb, a raised lobe at the ramrod entry and a raised beaver-tail apron, at the iron barrel tang. Retains sharp contours, smooth surfaces, 90%+ finish with some expected scattered minor handling marks, a small working-period repaired sliver at the bottom edge of the lock-mortise and the expected signs of use and wear of a Military Blunderbuss. Plain, Service Pattern, brass hardware with a fine untouched mustard-toned patina: the trigger-guard with a classic “ball type” forward finial; and the flat, screw-fastened, Sea Service buttplate with a simple rounded forward finial. 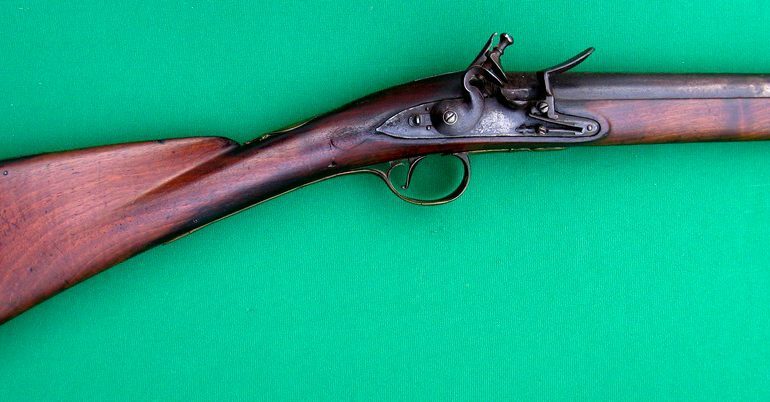 Regulation Shortland Pattern, flat sideplate with a tail and a single barrel-form ramrod pipe: made without a ramrod entry pipe, as is typical of early English Naval/Sea Service Arms. 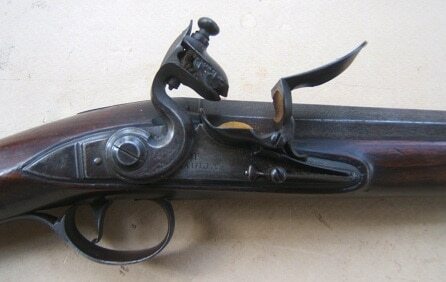 Retains untouched brass surfaces and in overall fine original flintlock condition. The barrel with sharp contours, clear markings and fine brass surfaces. In mechanically functional order. Fine walnut fullstock with sharp contours. Brass tip iron ramrod. 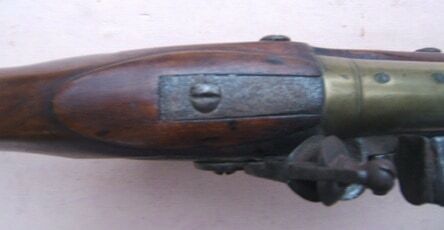 A very nice example of a classic French & Indian/American Revolutionary War Period English Sea Service/Naval Type Brass Barrel Military Blunderbuss, ca. 1750. Overall length, 32″.